PLEASE READ THESE TERMS AND CONDITIONS CAREFULLY BEFORE USING OUR SITE, THE EXCHANGE, OR ANY OTHER SERVICES AND REVIEW THEM PERIODICALLY AND REGULARLY FOR CHANGES. BY REGISTERING FOR, USING, OR ACCESSING THE EXCHANGE OR ANY PART THEREOF, YOU AGREE TO BE BOUND BY THESE TERMS AND CONDITIONS AND AGREE THAT SUCH TERMS AND CONDITIONS CONSTITUTES A LEGALLY BINDING AGREEMENT BETWEEN YOU AND US. IF YOU DO NOT AGREE TO BE FULLY BOUND BY ALL OR ANY OF THE TERMS OF THESE TERMS AND CONDITIONS, YOU MUST NOT MAKE ANY USE OF THE EXCHANGE OR OUR SITES. PLEASE NOTE THAT WE RESERVE THE RIGHT, AT OUR SOLE DISCRETION, TO REVISE THESE TERMS AND CONDITIONS, AT ANY TIME WITHOUT NOTICE, SUBJECT TO ANY RELEVANT LEGISLATION. “Airdrop” means an exogenous event to the host network where a user who holds a certain amount of a particular Crypto Asset is allocated a certain amount of the same or newly created Crypto Asset to their private keys. Newly created Crypto Asset may be allocated as a result of a fork of the blockchain or may be issued in a new and/or different blockchain. “Crypto Asset(s)” means a virtual commodity, digital asset, or a blockchain token (including but not limited to Bitcoin (BTC), Ether (ETH), Litecoin (LTC) and other cryptocurrencies and tokens the Exchange will make available and any other virtual commodities, digital assets, or blockchain tokens that ExCraft will decide at its sole discretion to support in the future, which is based on the cryptographic protocol of a computer network that may be (i) centralized or decentralized, (ii) based on proprietary or open-source software. “ExCraft ”, “Company”, “Ourselves”, “We”, “Us” collectively mean Quick Result Group Limited, a company incorporated under the laws of Territory of British Virgin Islands. “ExCraft Crypto Wallet” means one or more digital wallets that allow users to store certain supported Crypto Assets in their Accounts, and to track, transfer, and manage their supported Crypto Assets. “Exchange” means the digital assets trading platform as available on the Website. “Fork” means when two or more blocks have the same block height, forking the block chain. Typically occurs when two or more miners find blocks at nearly the same time. “KYC Policy” means the Know-Your-Client and Anti-Money Laundering policy as published by Us on the Website from time to time. “Restricted Jurisdictions” means any jurisdictions as may be designated by ExCraft from time to time, where the possession or trading of Crypto Assets is illegal or restricted. Such jurisdictions shall be listed in Appendix A of these Terms and Conditions. “Site” or “Website” collectively mean www.excraft.com or any other domain as used by us from time to time. “User”, “your” or “you” collectively means the Users accessing the Site. THE EXCHANGE, REGISTRATION AND ACCESS. 2.1 The Exchange may enable Users to access the Exchange via mobile or desktop device-based applications and websites. 2.2 The Exchange is currently offered on a self-service basis and fees will be charged for the use of features on the Exchange. For a full breakdown of the fees please refer to the fee schedule at www.excraft.com. 2.3 In order to access and use the Exchange, you must register on the Exchange as a User, complete the sign-up process and create an account (the “Account”) through the Site. 2.4 Your ExCraft Crypto Wallet allows you to send Crypto Assets that We support to request, receive, and store supported Crypto Asset from third parties pursuant to instructions you provide through the Site (each such transaction is a "Crypto Asset Transaction"). ExCraft reserves the right to refuse to process or to cancel any pending Crypto Asset Transaction: (1) as required by law; or (2) in response to a subpoena, court order, or other binding government order; or (3) to enforce transaction limits. ExCraft cannot reverse a Crypto Asset Transaction which has been broadcast to a Crypto Asset network and shall not be responsible for Crypto Asset Transaction sent to incorrect third-party addresses. It is the sole responsibility of every User to check whether any third-party address is correct. The ExCraft Crypto Wallet services are available only in connection with those Crypto Assets that ExCraft, in its sole discretion, decides to support. The Crypto Assets that ExCraft supports may change from time to time. Under no circumstances should you attempt to use your ExCraft Crypto Wallet to store, send, request, or receive digital currencies in any form that are not supported by ExCraft. ExCraft assumes no responsibility or liability in connection with any attempt to use ExCraft Services for Crypto Assets that ExCraft does not support. For the list of supported Crypto Assets please consult the following guide at www.excraft.com. 2.5 Once a Crypto Asset transaction is submitted to a Crypto Asset network, a Crypto Asset Transaction will be unconfirmed for a period of time pending sufficient confirmation of the transaction by the Crypto Asset network. A transaction is not complete while it is in a pending state. Funds associated with transactions that are in a pending state will be designated accordingly and will not be included in your ExCraft Crypto Wallet balance or be available to conduct transactions on the Exchange. ExCraft may charge network fees (also referred to as miner fees or gas) to process a Crypto Asset Transaction on your behalf. ExCraft will calculate the network fee in its own and absolute discretion and its determination with respect to the network fee which shall be final, although ExCraft will always notify you promptly of the network fee at or before the time you authorize the transaction. All fees will be deducted from your ExCraft Crypto Wallet balance respectively. 2.6 ExCraft securely stores all Crypto Asset private keys in our control in a combination of online and offline storage. As a result, it may be necessary for ExCraft to retrieve certain information from offline storage in order to facilitate a Crypto Asset Transaction in accordance with your instructions, which may delay the initiation or credit of such Crypto Asset Transaction for 48 hours or more. You acknowledge and agree that a Crypto Asset Transaction facilitated by ExCraft may be subject to delays. (vii) you agree to abide by any relevant laws or regulations in your jurisdiction, including but not limited to reporting any trading activities or profits for taxation purposes. 2.8 We reserve the right to suspend or terminate, at our sole discretion and without providing any prior notice, your registration or access to the Exchange or the Site, in the event when (i) we reasonably suspect that you have breached any of the Terms and Conditions, (ii) we have received a suspicion transaction (iii) we reasonably suspect fraudulent or illegal activities, or (iii) these Terms and Conditions has been terminated. 2.9 Each User is solely and wholly responsible for their own Account security. You must utilise all reasonable efforts to protect user credential from your Account, including without limitation to any personally identifiable information, from unauthorized access or use. We urge you to keep your Account password secure and to always log-off from the Exchange when leaving the device through which you accessed the Exchange unattended. You are advised to use various security measures to protect your Account such as two-factor authentication. In the event your system or infrastructure that are used for storage, processing or hosting user credential are breached or compromised, or if user credential is inadvertently exposed to non-authorized third parties, you shall notify ExCraft promptly of such a breach or exposure. You acknowledge that you are solely responsible for any damages arising from or relating to any authorized or unauthorized use of your Account. 2.10 You acknowledge and agree that you are solely and wholly responsible for obtaining and maintaining any hardware, facilities, connections, licences, permits, database, equipment, external software or any other resources as may be required and/or necessary for the use of the Exchange (such as, computer, mobile device, internet connection and telecommunications) and any relevant payment system (collectively, the “Facilities”). We do not and will not bear any liability for any cost, expense, loss or other damage you may suffer directly or indirectly with respect to such Facilities in connection with use of the Exchange. 3.1 The Exchange, including any enhancements, derivatives and improvements thereof, are the sole property of ExCraft. Without limitation of the foregoing, all the text, images, sounds, music, marks, logos, compilations (meaning the collection, arrangement and assembly of information), and other content on the Website or the Exchange (collectively, the “Exchange Content”), and all software embodied (including all source and object code) in the Exchange or ExCraft servers or otherwise used by ExCraft to deliver the Exchange (“Software”), are the property of ExCraft and is protected by copyright, trademark and other intellectual property laws. Nothing in these Terms and Conditions shall grant the User any of such property rights and/or ownership rights and shall not be as an assignment of such rights. 3.2 Any rights with respect to the Software or the Exchange Content (collectively, the “ExCraft Exchange Property”) which are not expressly granted herein are reserved by ExCraft. 4.1 We grant you a personal, revocable, non-assignable, non-perpetual and non-exclusive licence that grants you the right to access and use the Exchange as a licensee, provided that you fully comply with these Terms and Conditions. 4.2 The above licence does not permit you to rent, lease, lend, sell, redistribute or sublicense the Exchange or any part thereof, or any other part of ExCraft Exchange Property. You shall not (nor attempt to) copy, decompile, reverse engineer, disassemble, derive the source code of, modify, or create derivative works of the underlying platforms of the Exchange or any other part of the ExCraft Exchange Property or in any other way manipulate the Exchange, ExCraft will take all appropriate action to protect the ExCraft Exchange Property. 4.3 You shall not remove any copyright, trademark or other proprietary notices that have been placed on the ExCraft Exchange Property. 4.4 You shall not exploit the Exchange in any unauthorized way whatsoever, including but not limited to trespass or materially burden network capacity. 4.5 We reserve the right to apply limits on the use of the Exchange, for example, by limiting the available features, or number of supported Users and/or transactions. We further reserve the right to publish such limitations, have them differ from User to User, or change such limitations at will, in each case in our sole discretion. 5.1 Persons located in the countries specified as Restricted Jurisdictions are not permitted to use the Website. This restriction also applies to residents and citizens of other nations while located in a Restricted Jurisdictions. The fact that the Website is accessible in a Restricted Jurisdictions, or that the Website allows the use of the official language of a Restricted Jurisdictions, shall not be in any way construed as an endorsement or to authorize using the Website in such Restricted Jurisdictions. Any attempt to circumvent this restriction, for example, by using a virtual private network, proxy or similar service that masks or manipulates the identification of your real location, or by otherwise providing false or misleading information regarding your citizenship, location or place of residence, or by using the website through a third party or on behalf of a third party located in a Restricted Jurisdictions is a material breach of these Terms and Conditions. If it becomes apparent, or we have reasonable grounds to suspect, that you are located in any of the Restricted Jurisdictions, this may result in closing your Account, without an obligation to provide you with advance notice, and if required by law all necessary reports will be made to respective authorities, all in accordance with applicable laws and agreements. FEES, TAXES AND PAYMENT TERMS. 6.1 The Exchange provided to you is subject to fee schedule in www.excraft.com. 6.2 You agree that you are responsible to calculate, validate and pay any and all sales, use, excise, import, export, value added, withholding and other taxes and duties assessed, incurred, or required to be collected (“Taxes”). ExCraft is not responsible for determining whether Taxes apply to your transaction, or for collecting, reporting or remitting any taxes arising from any transaction or for reporting any information, to you or any taxation, governing or legal authority. You agree to indemnify us and our affiliates against any claim or demand for payment of any fines, penalties, similar charges or costs imposed or incurred as a result of your failure to remit or report any Taxes in connection with any transaction. 6.3 Should such fees apply, without derogating from any other remedy available to ExCraft， ExCraft, at its sole discretion, may suspend or terminate the access and right to use all or any portion of the Exchange, at any time, upon electronic notice to you, if you fail to pay the fees or any part thereof on time. 7.1 You agree that we may periodically collect, store and use data (including, but not limited to technical information) in connection with your registration or use of the Site and the Exchange (“Usage Data”). We may also collect information about Users who accessed the Exchange (“User Data”). In addition, our systems may automatically collect other data about your operations, depending on the specific technology used by you for the implementation of the Exchange. 7.2 The Usage Data and User Data is our property. You hereby give us your affirmative consent to use such data: (i) to provide access to the Exchange to You and to others; or (ii) to improve the Exchange; or (iii) to personalize and enhance the use of the Exchange; or (iv) to determine those areas which are useful or popular and those that are less; or (v) to keep record of correspondence with you; or (vi) to address any issues that you are having with the Exchange; or (vii) to evaluate your use, preferences and trends for internal statistical and analytical purposes and in respect of operations and product development. We may also use the Usage Data and User Data to offer cross-promotions of ExCraft and its business partners’ products and the Exchange. 7.4 ExCraft may share your personal and other information (“Information”) with our affiliate companies to verify and validate Information, and to address customer service matters. While ExCraft does not sell your information, we may need to share or pass your Information with third parties acting on our behalf or as may be required by law, regulations or court order. 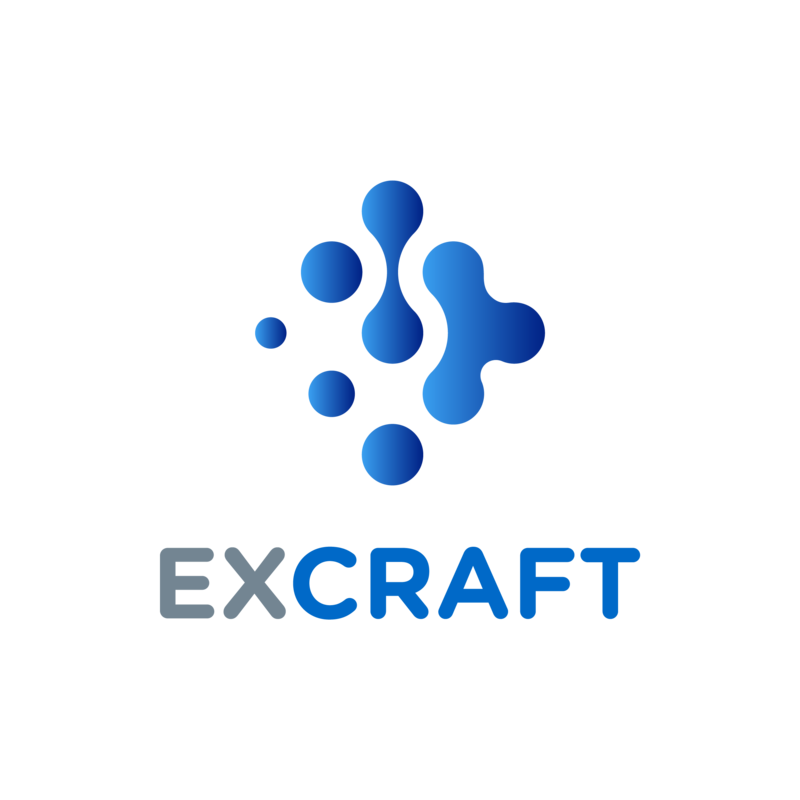 We will use reasonable efforts to ensure that your Information is used in a reasonable manner and you hereby agree and permit ExCraft to share your Information with regulators, law enforcement authorities and government agencies if ExCraft is so requested. 7.5 ExCraft will store your Information in accordance with the data protection principles contained within the Personal Data (Privacy) Ordinance (Chapter 486 of the Laws of Hong Kong). All of our policies related to your Information shall be contained in the ExCraft Private Policy. 7.6 Our KYC/AML Policy is guided by the Hong Kong Anti Money Laundering and Counter Terrorist Financing Ordinance (Chapter 615 of the Laws of Hong Kong) (“AMLO”), specifically, the AML and Counter-Terrorist Financing (“CTF”) provisions. These standards are designed to prevent the use of the Exchange to aid money laundering or terrorist financing activities. We take compliance very seriously and it is our policy to take all necessary steps to prohibit fraudulent transactions, report suspicious activities, and actively engage in the prevention of money laundering and related acts that facilitate money laundering, terrorist financing or any other financial crimes. PROHIBITED USE, PROHIBITED BUSINESSES AND CONDITIONAL USE. Abusive Activity: Actions which impose an unreasonable or disproportionately large load or pressure on our infrastructure, or detrimentally interfere with, intercept, or expropriate any system, data, or information; transmit or upload any material to the Site that contains viruses, Trojan horses, worms, or any other harmful or deleterious programs; attempt to gain unauthorized access to the Site, other Accounts, computer systems or networks connected to the Site, through password mining or any other means; use Account information of another party to access or use the Site, except in the case of specific merchants and/or applications which are specifically authorized by a user to access such user's ExCraft Account and information; or transfer your Account access or rights to your Account to a third party without our prior consent, unless by operation of law or with the express permission of ExCraft. Fraud: Activity which operates to defraud ExCraft, ExCraft users, or any other person; provide any false, inaccurate, or misleading information to ExCraft. Intellectual Property Infringement: Engage in transactions involving items that infringe or violate any copyright, trademark, right of publicity or privacy or any other proprietary right under the law, including but not limited to sales, distribution, or access to counterfeit music, movies, software, or other licensed materials without the appropriate authorization from the rights holder; use of ExCraft intellectual property, name, or logo, including use of ExCraft trade or service marks, without express consent from ExCraft or in a manner that otherwise harms ExCraft or the ExCraft brand; any action that implies an untrue endorsement by or affiliation with ExCraft. 8.2 In addition to the Prohibited Uses described above, the following categories of businesses, business practices, and sale items are barred from using ExCraft services ("Prohibited Businesses"). Most Prohibited Businesses categories are imposed by the requirements of our banking providers or processors or other relevant regulatory bodies. The specific types of use listed below are representative, but not exhaustive. YOU ACKNOWLEDGE, THAT TO THE MAXIMUM EXTENT PERMITTED BY APPLICABLE LAW, THE EXCHANGE, INCLUDING WITHOUT LIMITATION THE SITE AND OTHER MATERIALS PROVIDED TO YOU BY EXCRAFT, ARE PROVIDED ON AN “AS IS” BASIS. OTHER THAN EXPRESSLY PROVIDED UNDER THE AGREEMENT, EXCRAFT GIVES NO OTHER WARRANTIES BE THEY IMPLIED, STATUTORY OR IN ANY COMMUNICATION WITH USER. THE USE OF THE EXCHANGE AND RELIANCE ON THE CONTENT AVAILABLE THROUGH THE EXCHANGE IS DONE SOLELY AT YOUR OWN RISK. EXCRAFT DISCLAIMS ANY AND ALL WARRANTIES RELATING TO THE EXCHANGE AND THE SITE, THEIR CONTENT AND OTHER MATERIALS, EXPRESS OR IMPLIED, INCLUDING, BUT NOT LIMITED TO THE IMPLIED WARRANTIES OF NON-INFRINGEMENT OF THIRD PARTY RIGHTS, SATISFACTORY QUALITY, AVAILABILITY, SECURITY, TITLE, ABILITY TO OPERATE AND FITNESS FOR A PARTICULAR PURPOSE. ANY RELIANCE ON THE EXCHANGE IS AT THE USER’S OWN RISK. EXCRAFT DOES NOT WARRANT THAT THE EXCHANGE WILL MEET YOUR REQUIREMENTS AND DOES NOT GUARANTEE THAT THE USE OR OTHER EXPLOITATION OF THE EXCHANGE OR THE SITE WILL LEAD TO CERTAIN RESULTS. NO ADVICE OR INFORMATION, WHETHER ORAL OR WRITTEN, OBTAINED BY YOU FROM EXCRAFT OR THROUGH THE EXCHANGE WILL CONSTITUTE ANY WARRANTY AND/OR REPRESENTATION. WE DO NOT WARRANT NOR REPRESENT THAT ANY CONTENT OR THE EXCHANGE PROVIDED WILL BE ACCURATE OR ERROR-FREE, THAT ACCESS THERETO WILL BE UNINTERRUPTED, THAT ALL DEFECTS WILL BE CORRECTED, OR THAT THE SERVERS, AND THE CONTENT AVAILABLE THERE IS OR WILL BE FREE OF VIRUSES OR OTHER HARMFUL COMPONENTS. EXCRAFT MAY PAUSE OR INTERRUPT THE EXCHANGE SERVICES AT ANY TIME, AND USERS SHOULD EXPECT PERIODIC DOWNTIME FOR UPDATES TO THE EXCHANGE SERVICES. WE WILL NOT BE LIABLE TO YOU OR ANY THIRD PARTY FOR ANY DIRECT, INDIRECT, INCIDENTAL, SPECIAL, CONSEQUENTIAL OR EXEMPLARY DAMAGES (INCLUDING DAMAGES FOR LOSS OF PROFITS, GOODWILL, USE, OR DATA), EVEN IF A PARTY HAS BEEN ADVISED OF THE POSSIBILITY OF SUCH DAMAGES. FURTHER, WE WILL NOT BE RESPONSIBLE FOR ANY COMPENSATION, REIMBURSEMENT, OR DAMAGES ARISING IN CONNECTION WITH: (A) YOUR INABILITY TO USE THE EXCHANGE, INCLUDING AS A RESULT OF ANY (I) TERMINATION OR SUSPENSION OF THE TERMS AND CONDITIONS, (II) OUR DISCONTINUATION OF ANY OR ALL OF THE EXCHANGE, OR, (III) WITHOUT LIMITING ANY OBLIGATIONS UNDER ANY SEPARATELY AGREED SERVICE-LEVEL AGREEMENTS, ANY UNANTICIPATED OR UNSCHEDULED DOWNTIME OF ALL OR A PORTION OF THE EXCHANGE FOR ANY REASON, INCLUDING AS A RESULT OF POWER OUTAGES, SYSTEM FAILURES OR OTHER INTERRUPTIONS; (B) THE COST OF PROCUREMENT OF SUBSTITUTE GOODS OR EXCHANGE; (C) ANY INVESTMENTS, EXPENDITURES, OR COMMITMENTS BY YOU OR YOUR USE OF OR ACCESS TO THE EXCHANGE; OR (D) ANY UNAUTHORIZED ACCESS TO, ALTERATION OF, OR THE DELETION, DESTRUCTION, DAMAGE, LOSS OR FAILURE TO STORE ANY OF YOUR CONTENT OR OTHER DATA. YOU ACCEPT RESPONSIBILITIES OF ALL ACTIVITIES AND CONTENTS GENERATED BY YOU. YOU FURTHER ACKNOWLEDGE THAT EXCRAFT DOES NOT ACT AS YOUR BROKER, INTERMEDIARY, AGENT OR ADVISOR WITH RESPECT TO ANY TRANSACTION YOU MAKE OR PROPOSE TO MAKE IN THE EXCHANGE AND OWES YOU NO FIDUCIARY DUTY. ANY COMMUNICATION BY EXCRAFT TO YOU SHALL NOT BE CONSTRUED UNDER ANY CIRCUMSTANCES AS LEGAL, TAX, ACCOUNTING OR FINANCIAL ADVICE. 10.2 You shall indemnify us on demand for any damages and additional expense (including but not limited to legal costs and debt collection expenses) ExCraft may suffer or incur, directly or indirectly, as a result of unlawful, reckless or negligent actions conducted by you. We reserve the rights to settle such balances by transferring funds (including but not limited to all digital assets) from your Accounts as managed by or with ExCraft at any time. 11.1 The Terms and Conditions shall, in addition to any other terms and conditions, be as agreed between ExCraft and the User, and in absence of any other indications these Terms and Conditions shall commence upon ExCraft’s acceptance of the User’s registration to the Exchange, and shall remain valid until further written notice is given by ExCraft. (iii) at ExCraft’s sole and absolute discretion. 11.3 Upon expiration or termination, (a) all rights and licenses granted hereunder shall terminate and ExCraft shall be entitled to disconnect the User from the Exchange; (b) the User shall cease the use of any ExCraft Exchange Property; (c) the User shall immediately destroy (or if ExCraft requests in writing, return) all of ExCraft’s property in its possession at the date of termination, including all confidential information, together with all copies and extracts of the same; (d) to the extent that is permissible under the applicable laws and regulations and without prejudice to your rights thereunder, all data (including personal data as defined in the Personal Data (Privacy) Ordinance Cap. 486) and materials of the User remaining on the Exchange may be retained, used or analysed by ExCraft for such period for the purpose of improving its Exchange and may become ExCraft Exchange Property; and (e) clauses 3, 5, 9, 10, and 13 of these Terms and Conditions shall remain in effect. We will only respond to claims involving alleged copyright infringement made by ExCraft. We reserve the right at any time and in our sole discretion, to remove content which in our sole judgment appears to infringe the intellectual property rights of another person. 13.1 ExCraft reserves the right to close inactive accounts that have exhibited no events or transaction activity for a period greater than 36 months. The Users whose Accounts will be closed as a result of this condition will be contacted by ExCraft using your registered email address 3 months prior to Account closure. After the Account is closed, you will have 3 months to make arrangement for any funds held in the account or notify ExCraft by email that you wish to keep the Account open. ExCraft will not be liable for any funds that were held within the Account after 3 months from Account closure. 14.1 ExCraft may link to other third-party websites for convenience only and such third-party websites are not part of the Site. ExCraft does not endorse, confirm or support the contents of any third-party websites. ExCraft is not responsible for the content of a third-party website and cannot attest to the accuracy and completeness of such content. You acknowledge that your use of any third-party website is at your own risk. CYBERATTACKS AND MODIFICATIONS ON BLOCKCHAIN NETWORK. 15.1 ExCraft does not have any ability to prevent or mitigate cyberattacks and modifications on the blockchain networks (“Modification”). ExCraft reserves the right to take commercially reasonable actions in such event. If ExCraft determines the Crypto Asset is active on the Exchange has been compromised, ExCraft may halt trading, deposits and withdrawals for such Crypto Asset. If ExCraft determines the Modification to greatly decrease the value in such Crypto Asset, ExCraft may discontinue trade activity on such Crypto Asset entirely. ExCraft does not have any obligation to engage in any activity in connection or in response to any Modifications on blockchain networks. (ii) that the underlying protocols are subject to sudden changes in operation rules (i.e. Forks), and that such changes may materially affect the value, function, availability and/or even the name of the Crypto Asset you store in the Account. 16.2 In the event of any sudden changes resulting in the occurrence of a fork (including but not limited hard forks and airdrops), ExCraft reserves the right to decide which version of the fork is recognised and supported (such decision will be published via an official statement). Do not attempt to use your Account to receive, request, send, store or engage Crypto Assets that are not supported by the Exchange. 16.3 The Exchange reserves the right to halt trading, deposits and withdrawals for extended periods of time subject to the Exchange’s absolute discretion in order to protect customer funds from network instability and faults resulting from the occurrence of a fork. If there is a risk of multiple currencies resulting from a Fork, the Exchange reserves the right to determine which blockchain represents the original blockchain. 16.4 The Crypto Assets that you send to the ExCraft Account shall are held by ExCraft for your convenience and ExCraft is not by any means hold the Crypto Assets as a deposit (bearing interest or not), nor does it act as a bailee for the Crypto Assets and it does not hold the Crypto Assets on trust and assume any fiduciary duties over such Crypto Assets. For the avoidance of doubt, you should not expect any new or additional Crypto Assets that could be created by Forks of a blockchain to be credited or accrued to your Account. 16.5 In the event of a Fork, the value, function, and/or even the name of the Crypto Asset you store on the Exchange may be materially affected. In any such event, you agree that ExCraft may temporarily suspend the service (with or without advance notice to you) in its sole discretion and ExCraft may decide based on commercially reasonable efforts either (a) configure or reconfigure its systems or (b) not to support (or cease supporting) the branch derived from the forked protocol. In the instance of any private keys held and managed by ExCraft, ExCraft does not convey ownership or any related rights associated with the Users. You acknowledge and agree that ExCraft assumes absolutely no responsibilities whatsoever in respect of an unsupported branch of a forked protocol. 16.6 By depositing your Crypto Asset on the Exchange, you will not receive any tokens which may accrue to you had you kept the Crypto Assets on your own wallet. You are advised to withdraw your Crypto Assets from the Exchange. If you wish to receive any new protocol and its associated tokens resulting from Forks and Airdrops, you should withdraw your Crypto Asset to an external wallet or any hardware wallet device that is capable of accessing the airdrop or fork. 17.1 Notwithstanding any other provision of this Terms and Conditions, any translation of this Terms and Conditions is provided for your convenience. The meanings of terms, conditions and representations herein are subject to definitions and interpretations in English. You agree that in the event of any conflict between the English version of the foregoing documents and any other translations thereto in the Website, the English version shall prevail. 18.1 ExCraft and the User are and intend to remain independent parties. Nothing in these Terms and Conditions shall be deemed or construed to create the relationship of a principal and agent or partnership or joint venture, or that of an employee and employer between ExCraft and the User and ExCraft shall not assume any fiduciary duties to the User. 18.2 This Terms and Conditions represents the entire agreement between ExCraft and User and supersedes any and all other agreements between the parties, whether written or oral, regarding the subject matter hereof (but not include any add-on services as may be requested by the User). Unless otherwise specified in writing by ExCraft, these Terms and Conditions shall govern and supersede any other agreement entered into between ExCraft and you. ExCraft may assign its rights or obligations pursuant to these Terms and Conditions while the User agrees not to assign any rights under these Terms and Conditions without ExCraft’ explicit written consent. 18.3 No waiver of any term of these Terms and Conditions shall be deemed a further or continuing waiver of such term or any other term, and any failure to assert any right or provision under these Terms and Conditions shall not constitute a waiver of such term. 18.4 The section titles in these Terms and Conditions are solely used for the convenience and have no legal or contractual significance. 18.5 Your electronic assent or use of the services shall constitute execution of these Terms and Conditions. You agree that the electronic text of these Terms and Conditions constitutes a “writing” and your assent to the terms and conditions hereof constitutes a “signing” for all purposes. 18.6 If any part of these Terms and Conditions shall be invalid or unenforceable, such invalidity or unenforceability shall not affect the validity or enforceability of any other part or provision of these Terms and Conditions which shall remain in full force and effect. If any provision or part-provision of these Terms and Conditions is or becomes invalid, illegal or unenforceable, it shall be deemed modified to the minimum extent necessary to make it valid, legal and enforceable. If such modification is not possible, the relevant provision or part-provision shall be deemed deleted. Any modification to or deletion of a provision or part-provision under this paragraph shall not affect the validity and enforceability of the rest of these Terms and Conditions. 18.7 ExCraft reserves the right, at its sole discretion, to change, add or remove portions of these Terms and Conditions at any time. Such notification will be made via the Website and it is your responsibility to review the amended Terms and Conditions. Your continued use of the Website and Platform following the posting of changes will mean that you accept and agree to the changes and you agree that all subsequent transactions by you will be subject to these Terms and Conditions. 18.8 The Terms and Conditions shall be governed by the laws of the Hong Kong Special Administrative Region as to all matters including validity, construction, effect, performance and remedies without giving effect to the principles of choice of law thereof. In the event of any dispute, controversy, or claim arising out of or relating to these Terms and Conditions or the construction, interpretation, performance, breach, termination, enforceability or validity thereof (a “Dispute”), the party raising such Dispute shall notify the other party promptly and no later than sixty (60) days from the date of its discovery of the Dispute. The parties shall cooperate and attempt in good faith to resolve any Dispute promptly. 18.10 All decisions with respect to purchasing, selling or trading Crypto Assets are made solely by you. Notwithstanding anything in these Terms and Conditions, we accept no responsibility whatsoever for and shall in no circumstances be liable to you in connection with such decisions. Under no circumstances will the operation of ExCraft be deemed to create a relationship that includes the provision or tendering of investment, legal, accounting or tax advice. Please consult an appropriate professional advisor before making any decisions to purchase, sell or trade with Crypto Assets.